Does Democratic gubernatorial candidate J.B. Pritzker really have a plan that would make the wealthy pay more while protecting the middle class and helping fund our schools, as his campaign ads proclaim? "Let's institute a progressive income tax, so we can lower the tax burden on the middle class and those striving to get there," explains Pritzker. Or will his call for graduated income tax rates be a "disaster for the state of Illinois" that "ultimately... will kill the middle class," as his November opponent, Republican Gov. Bruce Rauner, contends? "First of all business owners will flood out of the state," Rauner says. "It will lower our tax base, but more importantly in every state that puts in a graduated income tax hike, the middle class ends up paying more. The middle class gets whacked in the end." Beyond political talking points, whether Illinois should replace its flat-rate income tax with a graduated rate tax is an important public policy debate. Under the tax structure in place since Illinois first enacted an income tax in 1969, taxpayers at all income levels pay the same rate - currently 4.95 percent for individuals - on their first dollar of taxable income as on their last dollar. 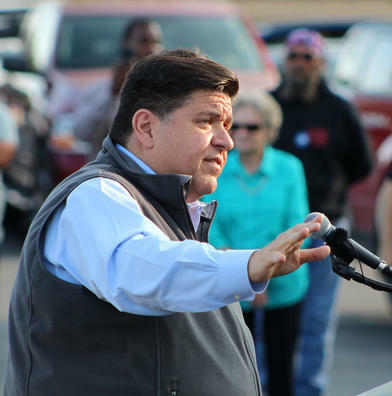 Democratic gubernatorial candidate J.B. Pritzker has proposed a graduated tax system for Illinois. 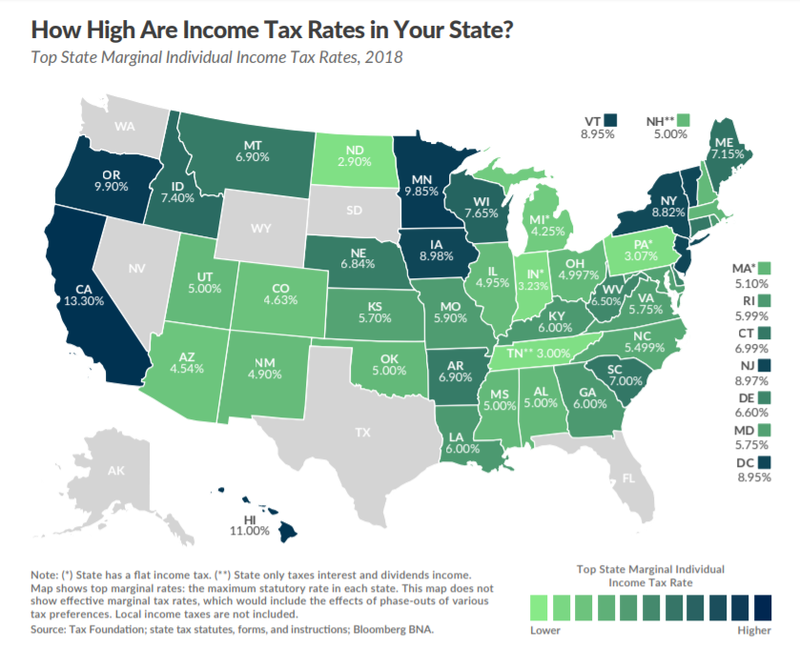 Under a graduated rate structure - employed by 33 of the states taxing wages - a taxpayer pays one rate on the first dollar, and successively higher rates on additional dollars above set levels, or brackets. Think the federal income tax, with its lengthy tax tables. So as an example, Pritzker or Rauner would have the same income tax rates on the almost infinitesimal slice of their taxable incomes that most folks would pay on their total income. But when taxable income hits Himalayan heights, e.g., as in the case of the two gubernatorial rivals, they'd pay a higher rate on those additional dollars, as high as California's 13.3 percent on income amounts in excess of $1 million. Which system is fairer? Which would produce more stable, yet adequate revenues? Which is easier to administer? Academics and economists may enjoy debating such questions in the abstract-- practitioners and policy advocates, too. But politicians deal in pragmatism - how will voters react to a given policy. At first blush, one might surmise they'd approve; after all, when asked in a 2014 referendum whether a 3 percent surcharge should be tacked onto income greater than $1 million, 60 percent of Illinois voters said "yes." 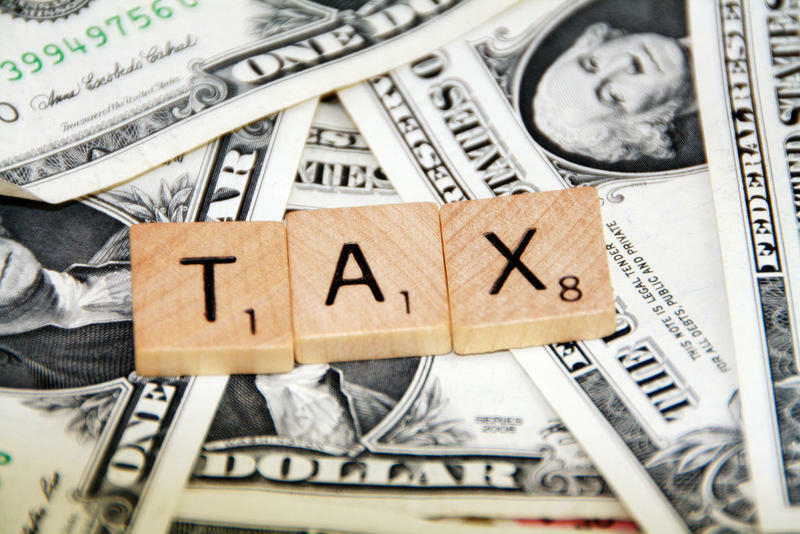 And last month, a Simon Institute poll found 76 percent of respondents favored the so-called "millionaire's tax," while 72 percent supported a graduated income tax, with higher rates for higher earners and lower rates for lower earners. But the switch would require changing the constitution's Revenue Article, which stipulates that any income tax "shall be at a non-graduated rate." A proposed constitutional amendment to impose the 3 percent surcharge fell short in the House two years ago, garnering only 68 votes, three shy of the three-fifths required for approval, as Republicans were unanimously opposed. Don't look for a similar amendment on the ballot this November, either, as Republican lawmakers appear even more hostile this time around, with GOP leaders sponsoring resolutions in both chambers opposing a graduated tax. 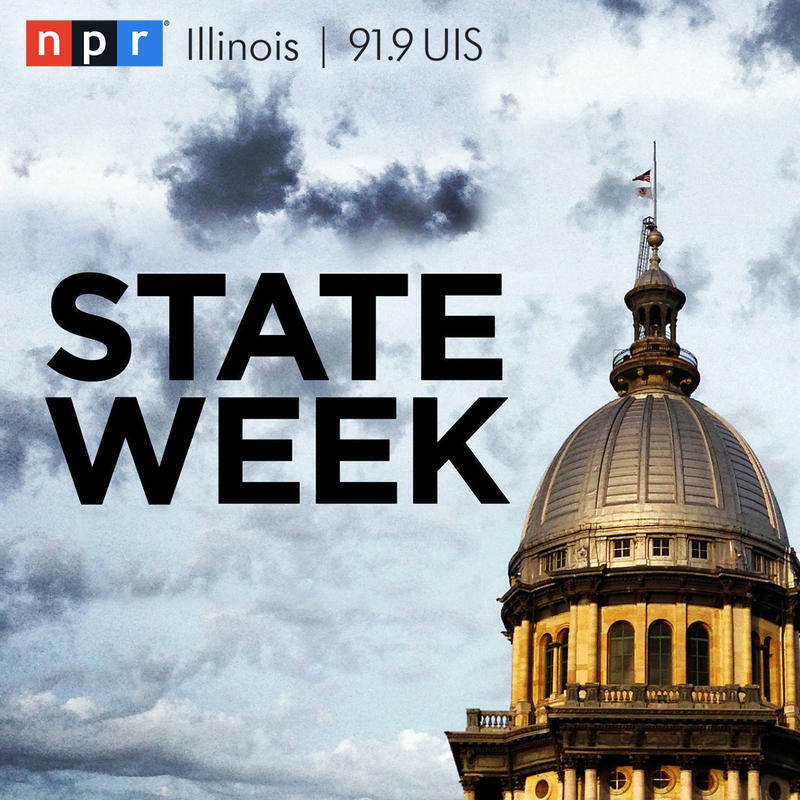 Republicans in the Illinois House say they will not support any plan to change the state’s income tax from a flat rate to a graduated system. House Republicans were particularly colorful, closing their arguments by declaring "A move to amend the Constitution to allow for such a repugnant affront to Illinois families would be an act of utter insult to Illinois taxpayers and a dereliction of the duty owed to taxpayers ... to improve the general welfare and protect the best interests of all Illinoisans. Nothing about creating an unfair, unequal, and avaricious tax system helps the General Assembly accomplish these ends." Those sentiments guarantee that no proposal will win three-fifths majorities in both the House and the Senate by the May 6 deadline for amendments to go to the voters. 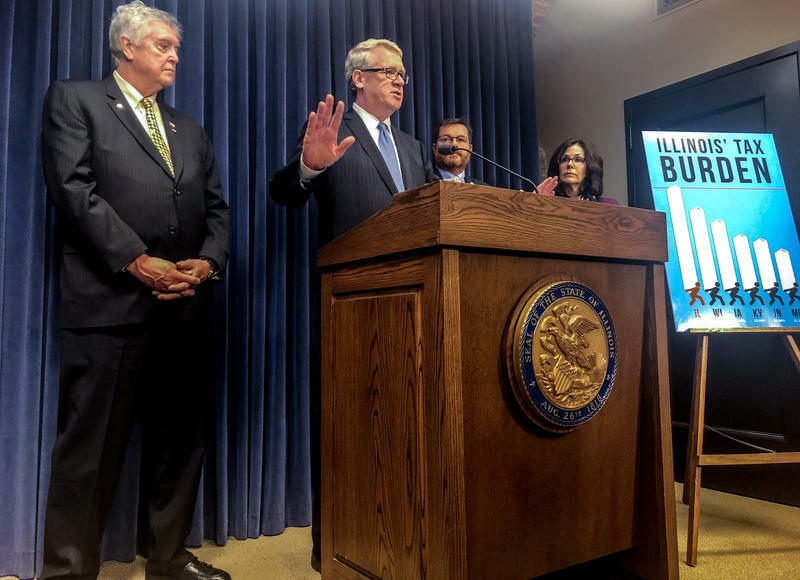 Pritzker has acknowledged the fact, saying for the time being that the existing exemptions and earned income tax credit should be increased to lessen the burden on middle- and lower-income taxpayers, creating a "kind of artificial gradual income tax in the state." But the Democrat has not provided any details about the rate structure he'd like to enact, making his idea an easy target for Republican criticism, a la Rauner's "disaster" or the prediction by Rep. Mark Batinick of Plainfield that "The vast majority of people will be left paying more in taxes." In fact, no one can say with certainty that anyone's taxes will go up until actual rates and brackets are plugged into the graduated model. Consider an Illinois family with the median income household here, pegged at $60,960 in 2016, the latest year available from the U.S. Census Bureau. Assume the household is two parents and two kids, so they'd have $8,000 in personal exemptions, leaving $52,960 in taxable income; at Illinois' flat 4.95 rate, they'd owe $2,622. But if Illinois adopted the identical framework as Wisconsin, same rates, same provisions for reducing taxable income, our happy family would pay roughly $584 less. While the Dairy State's rates range from 4 percent on the first $14,980 of taxable income for joint filers up to 7.65 percent on anything in excess of $329,810, according to the Tax Foundation, our northern neighbors also allow deductions and exemptions worth $22,010, for a net taxable income of $38,950 and a $2,038 tax bill, according to the tax tables in Wisconsin's income tax instructions booklet. They'd save even more in Missouri, whose top rate of 5.9 percent kicks in for every dollar in excess of $9,072. But while the rate is almost a full percentage point higher than Illinois', Missouri deductions and exemptions would cut our family's taxable income almost in half, down to just $30,360, for a net bill of $1,592, based on the Show-Me State's official tax chart. That's $1,030 less than their Illinois tab. On the other hand, our family would pay $662 more if Illinois copied the Iowa income tax code with nine brackets and a top rate of 8.98 percent. Kentucky would take more as well, another $584, with its largest bracket - $8,001 to $75,000-taxed at 5.8 percent. And while Indiana, like Illinois, has a flat rate - 3.23 percent - the Hoosier State also allows local income taxes. For example, residents of Marion County pay a flat county income tax of 1.62 percent, pushing the aggregate rate to 4.85 percent in Indianapolis, just 0.1 percent less than in Chicago, or 10 cents saved on each $100 of taxable income. All the number-crunching reinforces the earlier point. Until actual numbers - rates, brackets, exemptions, deductions - are available, anybody's prediction about whose taxes will go up or down is just political rhetoric. Two years ago, for example, Rep. Lou Lang, a Skokie Democrat and deputy majority leader, proposed legislation that featured a 9.75 percent rate on joint filers' income above $1.5 million, but just 3.5 percent on income of $200,000 or less, a slight reduction from the then-3.75 percent flat rate. 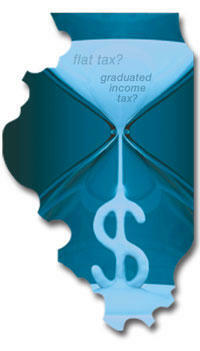 Lang predicted the new rate structure would cut taxes for 99 percent of Illinoisans. But the measure was contingent on voters approving a constitutional amendment to allow graduated rates, and when the amendment never cleared the Legislature, Lang's bill died. Gov. 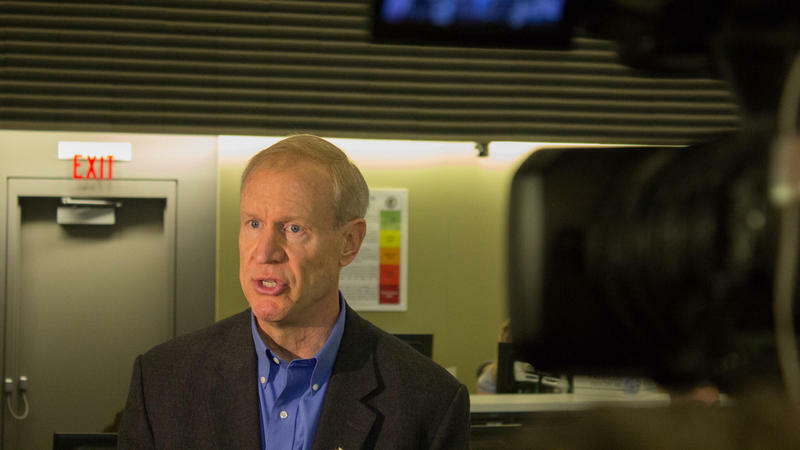 Bruce Rauner has said he is opposed to a graduated tax rate for Illinois. Republicans are willing to concede that such cuts are possible in theory, but highly unlikely in practice, given what they see as Democrats' fiscal nature. "They are not going to pass a progressive tax without having more money to spend," said House Republican Leader Jim Durkin of Western Springs. "It's in their DNA, it's in their body. It's how they operate." The best way - really the only way - to respond to the Republican campaign chatter would be for the Democratic nominee to present a detailed blueprint of the changes he'd like to make to the state's income tax code, with specifics like bracket ranges and rates, deductions and exemptions. Then taxpayers could see for themselves how they'd fare if Pritzker's vision becomes a reality.